New Year. New thread for day-to-day weather. Welcome to 2018's Day-to-day weather thread. By the way, the 2017 Day-to-day thread's 138 pages was a record high amount of pages for day-to-day weather discussion, beating the previous record of 123 pages of day-to-day discussion back in 2011. Looks that way for the next two weeks maybe even longer, except for a possible storm outbreak in NE NSW (only) next week. Wow, I picked a good time to head to NZ then. Looks to be quite hot in Warwick also in a few days. Looking forward to the cooler temps. Take care everyone and see you in a couple of weeks. Yo blokes (and ladies), happy new year. Seabreeze, that record you mention can only mean 1 thing, we waffle heaps. Luv it. I thank you all for your time, pics and input. Now back to my strong silent side. I did about 8 hours painting today - was good weather for it. What's the next event on the horizon? Looks to be pretty stable this week based on BOM forecast. Next Saturday, but still looks very patchy. La Nina causes lower SLPs in coastal Qld and western Coral Sea and not ridging. Next weekend is still looking a bit interesting - most models are still trying to bring a coastal change up the coast with decent instability ahead of it. The finer details of what could complicate it (e.g. moisture, capping, timing, cloud cover, etc) should hopefully become more apparent in the coming days. Some southern & western parts of our region could get some activity in the days before then as well. Every La Nina is different and has different effects. The Coral Sea is like a pressure cooker, sooner or later it will pop in a big way. Looking at BOMs SST's off the coast N of Fraser, its primed all right! Even off Bris its warm enough to support anything coming down. That GOC though, wow, thats ticking! Just need a trigger for the Coral Sea. But with the 30-40knot NE flow normally through the South China Sea which is needed to push the MT over NE OZ and the Coral Sea - still largely heading back into the Asian Continent due to a series of circulations above the Equator, we here in the East will be waiting a while yet. The NW of OZ is seeing what I call a " back door " monsoon flow, via India wrapping around these same NH lows. Splitting hairs between December and November, they're basically equal stormiest. November is the little more consistent of the two from year-to-year though. July is the least stormiest month by a country mile, no other month even comes remotely close to it. 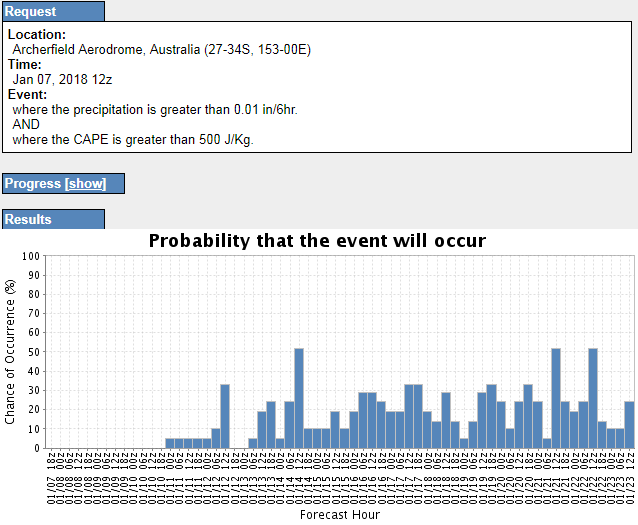 Seems that either the frequency of thunderdays has increased over the past 10 or so years Seabreeze and maybe the BOM need to think about compiling a new thunderday map for Australia, given that the one displayed on their website is for the years 1990 - 1999. What we see on that map for that period of time is a thunderday frequency of about 30 - 40 per year on average. Yeah it would seem the 1990-1999 period during which the BOM thunderdays map covers was less storm active than recent years (at least around this area). Generated in 0.054 seconds in which 0.030 seconds were spent on a total of 14 queries. Zlib compression disabled.